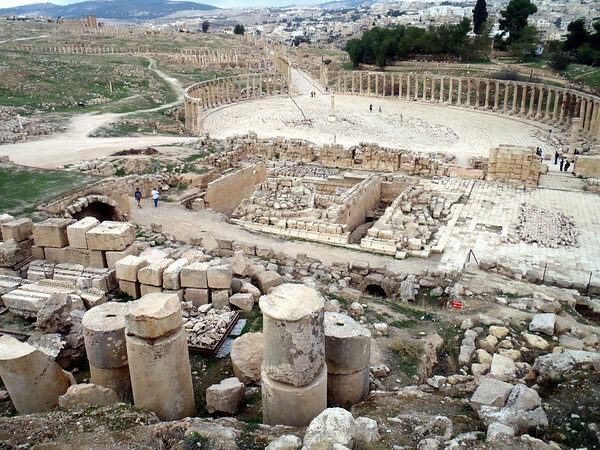 My first stop in Jordan was Jerash, home to ruins that I found more interesting than those at Palmyra. Exploring them had to wait a few days as I dealt with a bout of the flu, complete with sore joints, aching head, fever, sore skin, and lethargy. 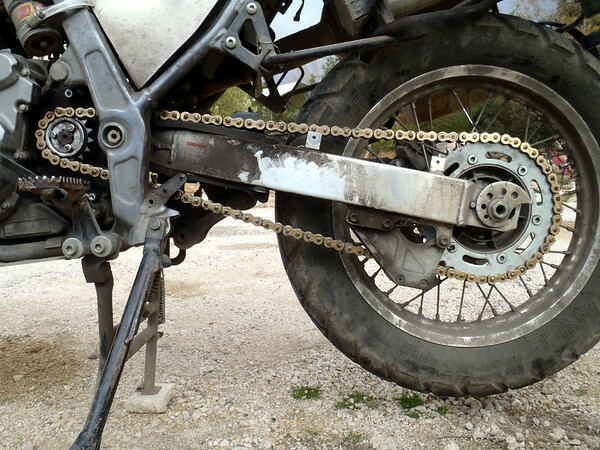 I found a hotel with campsites 7km west of town, and having time to kill, thought it would be a good time to change out the drive chain and sprockets on the bike. Doing something like this when ill is no fun, but I took my time, triple checked everything and took lots of rests during the operation. The old chain and sprocket set had lasted about 12,000 miles, which is not bad considering that I’d been lazy about chain maintenance. Having sorted that, I moved to a hotel in town to recuperate, and was there for three nights, eating lots of fruit, drinking water and watching movies on satellite TV. When I felt better, I spent a day in the ruins. 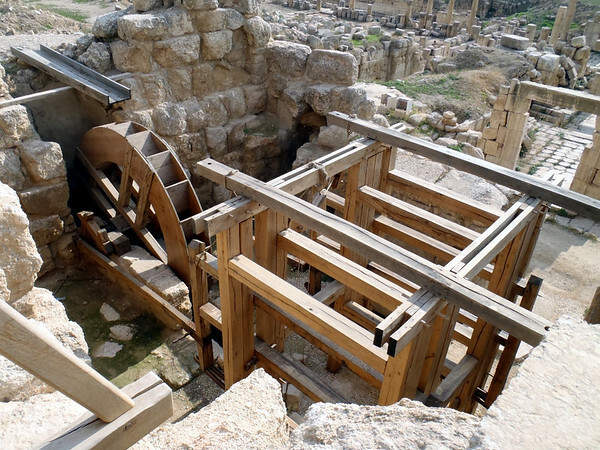 There is archaeological evidence of the site being inhabited in Neolithic times, but it came into its own starting in the time of Alexander the Great. 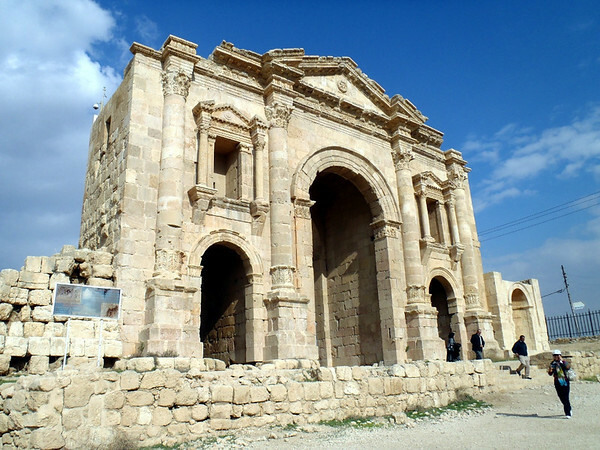 Like Palmyra, it flourished under Roman rule, later converted to Christianity, and finally Islam in the 7th century. When trade routes changed, the city lost prominence and its importance and population dwindled. Hadrian's arch, constructed for the emperor's visit in AD 129. The hippodrome, where chariot races are still held today! The reenactment comes complete with all of the correct livery for man and horses, and the announcements are even done in Latin. Retired military veterans man the chariots. Sadly, I was not there on race day. 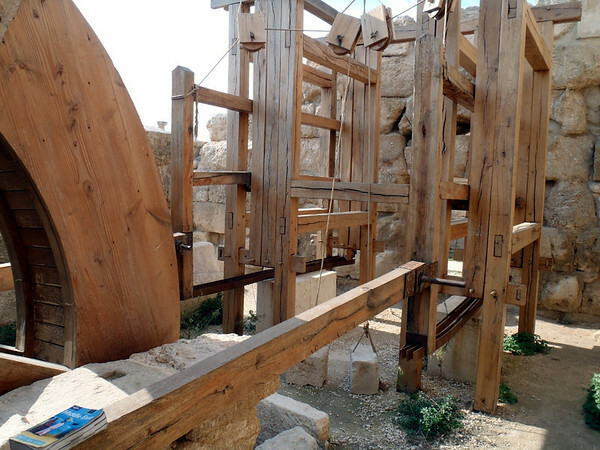 Reconstruction of a hydralically-powered rock saw, the oldest in the world, beating the Europeans by 1,000 years. Another view of the rock saw. Collonaded street (cardo maximus) connecting the Northern Tetrapylon (foreground) with the north gate. 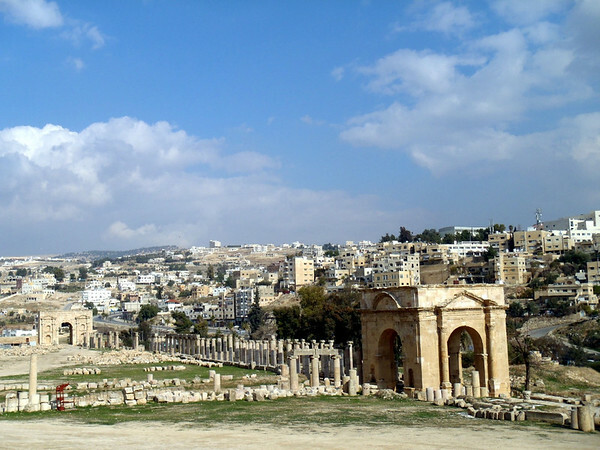 The handsome town of Jerash is built on a hillside in the background. The huge Oval Plaza (forum), 90 by 80 meters, with 56 Ionic columns surrounding the paved limestone plaza. On my way to the Dea Sea, I popped by to see the baptism site of Jesus and the slow, muddy Jordan river. Just a few meters away was the Israeli border, where guards took photos of the tourists, who were taking photos of the guards. 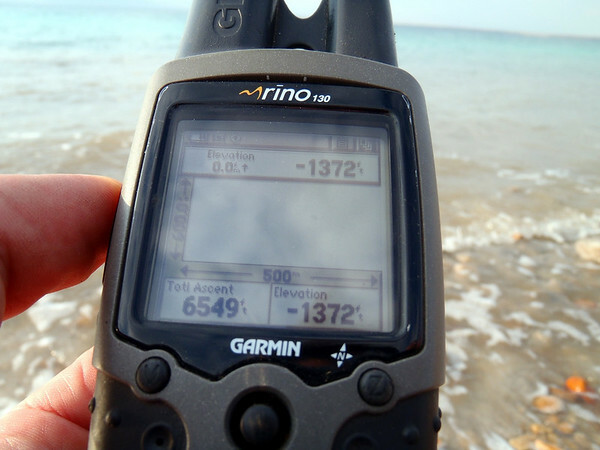 Bobbing in the Dead Sea was fun, and a little strange, with enough buoyancy to make sinking impossible. This was the "low point" of my trip. 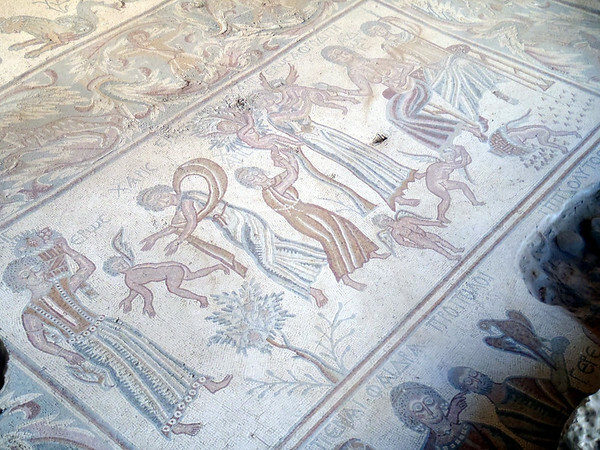 Next stop was Madaba to see Byzantine mosaics, including a 6th century map of Palestine, the oldest in existence. True to form, I arrived after dark and stopped on a street corner to ask direction. I was invited into a shop for tea and a chat with the owner and his friends, and eventually was given precise directions to the touristy part of town. The next morning I went cross-eyed looking at mosaics! 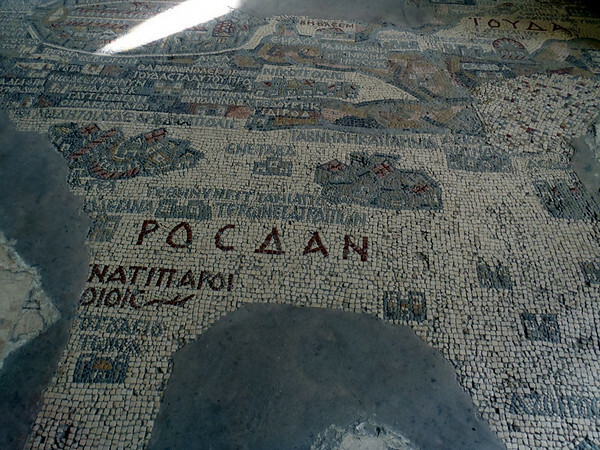 Part of the 6th century mosaic map, with 157 captions and featuring all of the biblical sites of the Middle East, from Egypt to Palestine. Tons more mosaics in the extensive Archaeological Park. Also the first documented "wet willy" (bottom right corner). 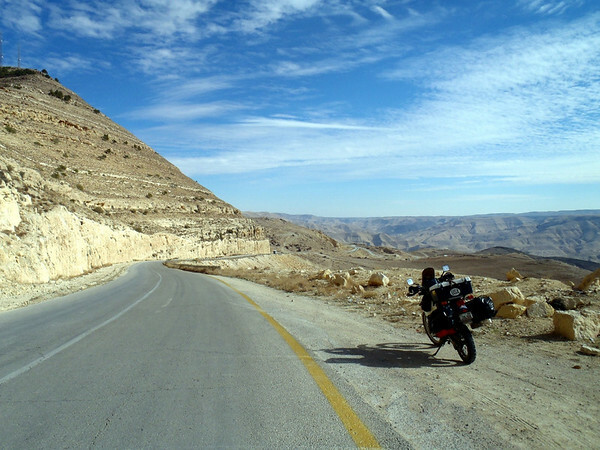 South of Madaba, I picked up the scenic King’s Highway. 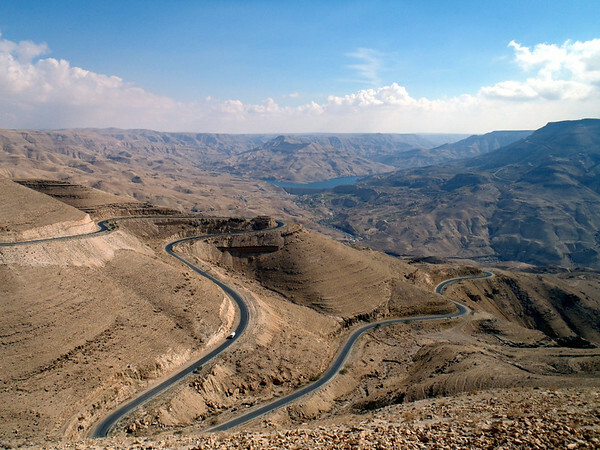 Eventually descending into the majestic Wadi Mujib. At a pullout I bought some fossils for friends back home, and over tea, tutored the young Valentino-wannabe salesman on the best ways to compliment western women. After a stop in Karak to see the castle, my destination was Wadi Musa and Petra. Got to find the Holy Grail before the Nazis get their paws on it! #1 | Written by April White Jeras about 8 years ago. Hope you’re on your way out of Egypt by now. Touch base when you’re able. #2 | Written by Karen about 8 years ago. Such a lovely view and post (remind me The Motorcycle Diaries). #3 | Written by April about 8 years ago. Silver City Fire Chief Rudy Bencomo said because the winds were still fueling the blaze, firefighters were in a defensive mode Monday night, evacuating people as necessary and trying to save as many homes as possible. Pretty scary lets hope it doesn’t make it over here this far and hope they are able to put it out tonight. It’s been windy, windy, windy, today strong winds so hopefully it doesn’t make it this far or we might be out our homes.